Scrimshaw is the name given to carvings and small sculptures created by whalers and made from the by-products of whaling and the harvesting of other marine mammals. It is most commonly made out of the bones and teeth of Sperm Whales. However it can also be from the baleen of other whales, and the tusks of the walrus. Scrimshaw takes the form of elaborate whale bone carvings in the form of pictures and lettering on the surface of the bone or often whale tooth. There are also small sculptures made from the same sources of ivory and bone. The making of scrimshaw began on whaling ships between 1817 to 1824 on the Pacific Ocean, and survived until the ban on commercial whaling. Scrimshanders still practice the art today and it survives as a hobby and as a trade for commercial artists. But, there are a great many restrictions on what you can do with whale bone and how it can be traded. Most modern Scrimshanders are ethical and will make sure they only use ethically recovered bone and ivory. A maker of scrimshaw is known as a scrimshander. 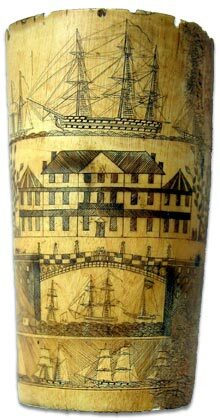 Most of the original scrimshaw created by whalers is currently held by museums. The New Bedford Whaling Museum in Massachusetts, USA. Privately held original Scrimshaw pieces are very valuable and a great many reproductions (commonly known as "fakeshaw") exist in the antiques marketplace. Tip! Confirming the provenance of individual Scrimshaw pieces can be difficult, but ensuring the source materials are legitimate ivory or whale bone carvings is the least you should do before collecting Scrimshaw or using your artistic skills to create new pieces.